Click the button below to add the 1 1/2" Hexagon Templates to your wish list. 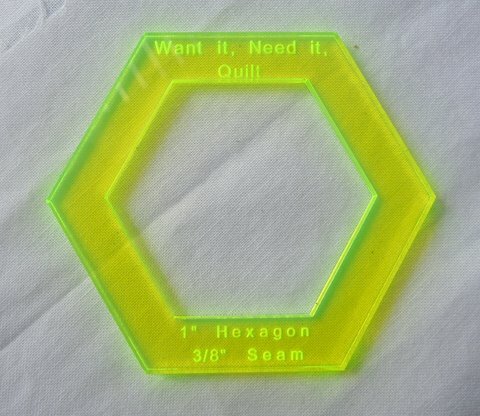 A great template for use with 1 1/2" sided hexagons. The design is perfect for fussy cutting fabrics. The template has 1/2" seam allowance. excellent service. I would recommend ordering from your company. Yet another Template for my collection. Do you ever think you should have bought a pair so you could wear them as earrings?? Maybe that's just me! Anyway, brilliant service and fantastic price. Great product for a great price. Also excellent customer service and delivery.